Australian Amateur Radio Call Signs may seem a little baffling but looking back at the way in which our call signs have evolved shows that it has been much more confusing in the past. There were wireless experimenters in most states of Australia from about 1897, very soon after Marconi's demonstrations in London. Engineers from the Post & Telegraph Dept., University researchers and a few individuals duplicated Marconi's wireless system in the period 1900-1904, with varying degrees of success. There were no call signs assigned at that time, and operators simply used their station location or their names or initials as identifiers. Experimenters were supposed to obtain permission from the "Royal Navy on Australian Station", ie before the formation of the Australian Navy, but most didn't bother and the Navy had no wireless to hear them anyway, although occasionally visiting Navy ships were equipped with wireless equipment. The Post Master Generals (PMG)’s department was launched in Federation in 1901, but was not involved in radio activities at this point in time. By 1904 the Australian Navy (actually the Royal Navy on Australian Station) did have several ships equipped with wireless and used the ship's names or initials as identification. For example the RNS "St George" was just "SG". The Navy was keen to restrict wireless to military purposes only, but wireless manufacturers saw Australia as a lucrative commercial market and demanded access. The Australian Government therefore enacted The Wireless Telegraphy Act of 1905 (October 1905) to place control of wireless under the PMG's Department. The W.T. Act did provide for private experimenters but because of the high fees (£3) and severe penalties (£500 fine or 5 years imprisonment for offences) very few licences were issued. A Mr H.G. Robinson obtained what was probably the first experimental licence issued, in November 1905 for "experiments in halls for lecture purposes", while the Marconi Co. (NZ) obtained a licence in 1906 for trials of communication between Victoria and Tasmania. Also in 1906 E.F.G. Jolley of Maryborough, Victoria, had stations in two houses about a mile apart. These licences all expired after 1 year. By 1908 the only experimental licence current in Australia was held by the engineer for the Victorian PMG, H.W. Jenvey, who built two stations early in 1908, one at St. Kilda and another 65 miles away at Queenscliff, Melbourne. In 1909 there were only two licences on issue, held by Henry Sutton at 290-292 Bourke St. Melbourne, with apparatus capable of a 250 mile range, and C.P. Bartholomew at Mosman, NSW, with a range of 1/2 mile. Henry was issued his 'provisional licence' on the 7 October 1909 by Sir John Quick, permitting a maximum signalling range of 250 miles. In 1910 the Australasian Wireless Company was licensed with the call sign ATY, and then it obtained AAA when a new station was erected at the 6th floor of the Hotel Australia, Sydney in 1911, with 2 masts on the roof. This was the first commercial license in Australia. This was in response to the Orient Steamship Company installing wireless telegraphy stations on each of its steamers to execute the new English mail contract issued early February 1910. As at Feb 16, 1910, just two full wireless telegraphy licences had been issued to Senator J.C.Neild (Elwood) and Mr G. Nightingall (Clifton Springs). The fees for these licenses were £3/3 a year. The PMG discouraged experimenters but after representations by the newly formed Wireless Institute of Australia in April 1910 it adopted a more liberal attitude to licensing so that by August 1911 there was a total of 27 authorised "experimental" stations, 22 located in Sydney, 3 in Melbourne, 1 in SA and 1 on King Island off Tasmania. Beginning mid-1910 the PMG Dept. issued the experimental stations with 2 letter call signs prefixed by "X" for experimental, with no distinction between states, or between private and commercial operators. For instance XAA was J.Y. Nelson (the Senior Electrical Engineer of the Sydney PMG Dept. and also the local radio inspector), F. Leverrier, a leading Sydney experimenter, was XEN, N.S. Gilmour, of St. Kilda, was XNG, Father A. Shaw of the Maritime Wireless Company had XPO and so on. By the way, the experimental licence consisted of 6 foolscap pages of regulations and restrictions and sketches of the equipment. None of the equipment could be altered without approval of the local PMG authority, who could make inspections at any time. Commercial wireless telegraphy operations were retained as a monopoly of the PMG. Experimental Licences current at August 1911. 12 A. Mcardle Kilkenny and Enfield, S.A. There are indications that a number of experimenters of the time did not apply for licences, either through ignorance of the requirements or deliberately, hoping not to be caught. When the government wireless stations at Sydney and Applecross (WA) commenced operations in 1912 they were allocated callsigns POS, for Post Office Sydney, and POP for Perth, (the other Australian stations as POA, POB, POH, POM, POP and POS) but following an international wireless convention which allocated prefixes on a world wide basis the PO was changed to a VI, hence VIS and VIP. The government established 22 coastal stations all with VI prefixes. In 1912 the callsign prefix letter V was a commemoration of the recent death of Queen Victoria and was used as a prefix in many Commonwealth countries from 1912. Australia was allocated the prefix group VH~VK, but these prefixes were not assigned to radio amateurs until 31 December 1928. At the same time, new regulations were introduced which banned the playing of gramophone records during the hours when broadcasting stations were operating. This meant that several call signs had to be altered to comply with the new series. For example in NSW, J.H. Pike who had been XJP received a new call of XDY, and C.S. Crouch XRT, became XCC. This change explains the discrepancy in early lists which show different call signs for the same person. When the initial series was filled an extra letter was added. In NSW, for instance, the block of XAA to XIZ allowed for 234 licences, and when they were used up the series was continued as XAAA - XIZZ. At the time an experimental licence cost £1/1/-. The Wireless Institute of Victoria printed a call book in about June 1914 listing every known amateur and commercial & shipping station, with information from PMG records. The XAAA type call identification became a little cumbersome so in July /August 1914 the calls were altered to X with a number to identify the state, then 2 letters, eg the PMG Radio Inspector's call in NSW became X2AA. See the XJBI licence document. Not many licensees had the chance to use the new calls before the declaration of World War 1 and all wireless experiments ceased in August 1914. Several people and organisations did obtain special permission to continue operations, such as the Perth Wireless Club, as a listening post only, for suspected spies in W.A. and Ernest Fisk, Manager of AWA, who could both transmit and receive. The Government wireless stations continued in operation but in November 1916 the Navy again took control of all wireless, including the commercial and government stations. After WW1 the Navy still controlled the airwaves and was reluctant to allow wireless experiments but following extended negotiations between the WIA and the Navy, Radio Commander Creswell agreed in June 1919 to issue Temporary Permits to experiment in Wireless telegraphy. These were for receiving only but permits to transmit and receive were issued to the WIA, a couple of Universities and one or two prominent experimenters. There were added restrictions to be observed if the licensee wished to use a valve (usually in a regenerative circuit which could perhaps cause interference to Navy wireless). At this time the Naval Director of Radio Services instigated a new call sign system consisting simply of the sequential licence number, prefixed by the state initial. For instance R.H. Davies of Melbourne obtained licence number 237 so his call sign was V.237 whilst the next applicant, A.B. Cummings in Queensland was call sign Q.238. By February 1920 more than 600 permits had been issued. In April 1920 the Government took charge and re-introduced regulations allowing experimental and instructional licences. An experimental licence cost £2/-/-. In September 1920, the Government amended the Wireless Telegraphy regulations to remove all wartime restrictions and placed the control of wireless under the "Director of Radio Telegraphy, Prime Minister's Department, Melbourne". The Prime Minister was in discussion with AWA over a UK/Australia communications link and wanted to keep close control of wireless, and the PMG was reluctant to take back responsibility for commercial wireless anyway because it was a money losing situation. When the new Director took over from the Navy in early 1921 he changed back to the pre-war call system of X2AA etc. Some "transmitters", as they were called, requested specific call signs, so for example one leading transmitter, Charles D. Maclurcan, obtained X2CM. a) transmit and receive and b) receive only. i) crystal receiver and ii) valve receiver. The cost of a licence became £1/-/- for the full licence and 10/- for the receive only licence. If a licensee had a valve receiver he had to be able to read morse code at 12 WPM, the reasoning being that if the valve broke into oscillation (as was likely with the unstable circuits or regeneration commonly used) and was interfering with one of the navy or commercial stations, which were still using morse, they could come back and tell the offender(s) to close down. The PMG's Department reluctantly took over the control and licensing functions from the Prime Minister's Dept. at this time, and the call signs were altered yet again, to XA2AA, XA3AA etc where "X" was for experimental and the "A" identified Australia on an international prefix system. Note that licences and call signs were issued for receiving purposes too, and in fact very few licensed experimenters actually had transmitting equipment. Up to this time there were only about 60 genuine amateur transmitters in all Australia. The other approx. 650 licensees were in fact "listeners" ie. they had receivers only and most had little technical interest or expertise, BUT they did have valid call signs. The regulations also provided for a Broadcast Licence which allowed an experimenter to transmit news and entertainment, but no advertising or payment was permitted. Other restrictions were the same as for the experimental Transmit Licence. As it cost £5, few experimenters took up this licence but a few did set up broadcast facilities and some went on to become prominent broadcasters. Although the regulations did not come into effect officially till 1 December 1922, experimental licences were issued from October 1922 with both transmitters and listeners receiving call signs. By mid-1923 around 700 call signs had been issued and NSW had used up all its 2 letter allocation and was about to issue 3 letter calls. However, in May 1923 the PMG decided to hold all further applications pending the release of new regulations which would include commercial broadcasting. There was growing public and industry agitation for broadcasting, so a conference of all interested parties was held in May 1923 to organise and regulate public broadcast operations. The 1923 Broadcasting Conference included representatives from all groups interested in wireless, who framed regulations to introduce and control public broadcasting. The conference was dominated by Ernest T. Fisk of AWA, who pushed through his proposal for the infamous "Sealed Set" system, whereby listeners could use a receiver tuned and sealed to receive one station only for a fee of up £4/4/- per year, with additional costs if one wanted to listen to another station. Experimenters lost some privileges to commercial interests and were misled by certain delegates. The new regulations were delayed so the PMG started to issue experimental licences once again, but this time only genuine transmitters received a call sign. When the new broadcast regulations finally became effective in August 1923 a new class of licence was issued, a "Broadcast Listener's Licence", costing 10/-.However, it was obvious that obtaining a receive only experimental licence for 20/-, with no restrictions on tuning, was cheaper than the broadcast listener's licence plus the station fee of £2/2/- to £4/4/-, and so somewhere around 1000 "listeners" applied for experimenter's licences. The broadcast stations soon complained that they were not receiving their expected fees so the PMG sent out letters to people who had receive only experimental licences, cancelling those licences and call signs and telling them to apply for a broadcast listener's licence. Many licences were in fact cancelled, but someone objected in early 1924 and the government found that as the licence was validly issued, it could not be cancelled, even though the licensee was not in all fairness a wireless "experimenter". To solve that problem, as each licence came up for renewal after 12 months, the licensee had to demonstrate that he was actually competent to experiment with wireless and was not just a "listener". Previously, any exam or morse test was at the discretion of the radio inspector and it appears very few previous applicants had to prove they knew anything about wireless. With the new approach, the number of experimental licences in the period 1924-1925 dropped significantly from the 1923 level and many names and call signs vanished. It was estimated in early 1925 that there were about 1200 experimental licensees in Australia, of which less than 90 were transmitters and the rest, even though they held call signs, should have been reclassified as Broadcast Listeners. Deleting all these listeners from the call sign lists left many gaps in the sequence up till the mid-'40s when growth in numbers finally made the 3 letter call sequence necessary. This practice of issuing call signs to listeners with no real technical expertise raises a problem concerning claims by some old timers' to precedence in amateur activities. For instance Miss F. Violet Wallace (later Mrs. McKenzie), is regarded as the first Australian female amateur, but the records show that there were four ladies, all listeners only but with valid call signs, before Miss Wallace obtained her licence. During the 1922-25 period experimenters were blamed for interference with other stations, and the Wireless Institute was keen to make a distinction between true "experimenters" who were engaged in research and wireless construction, and those who they called "amateurs", who were only listeners, using store bought or simple kit-built crystal or 1 valve sets. The amateurs were to blame for interference with broadcasts, but of course experimenters were more proficient! The Fisk "sealed set" scheme mentioned above was a failure and less than 12 months later another Broadcast Conference convened and new regulations closer to the present broadcast rules were issued by the PMG in July 1924. At this second conference the experimenters came under further pressure and lost more band space and privileges. One recommendation of the conference was to revoke all experimental licences and instead issue no more than 980 "Expert Experimental Licences" Australia wide to genuine experimenters, to be approved by the WIA. NSW VICTORIA SOUTH AUST. WEST AUST. QLD TAS. Fortunately the PMG rejected this proposal, and when it issued new Statutory Regulations in July 1924 it clarified the Experimental Licence and Broadcast Listeners Licence and at this time introduced formal examinations for the Amateur Operators Certificate of Proficiency (AOCP). The morse code requirement was 12 words per minute (WPM) and the exam cost 5/- whilst issue of a certificate cost another 2/6. 28/7/1925 PMG Wireless Branch writes to radio amateurs with approval to use the 20-36 metre band until 30/11/25. 13/10/1925 PMG Wireless Branch advises amateur band allocations are now 125-250m, 85-95m, 32-37, 21-23m and 8-10 metres. 23/6/1926 PMG Wireless Branch gives permission to use 100W for 6 months on the 8-10, 21-23, 32-37, 85-95 metre bands until 30/9/1926 when it is to be reconsidered. A further change in the call sign identifier occurred in 1927 when another international radio conference decreed that Australia should use the prefix OA effective from 1 February 1927, so we then had calls such as OA3BM, Howard Kingsley Love. "O" was for Oceania and "A" for Australia. Only a couple of years later yet another international agreement saw the calls changed to the current VK plus a number prefix, for instance VK2JP (J.H. Pike again). 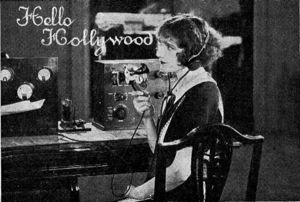 That change came into force at midnight of 31 December 1928, but the PMG Chief Radio Inspector, Mr. Jim Malone, decided that VK call signs would be used from 8 December 1928 so that the change would be fully implemented by 1 January 1929, which explains why some contacts and QSL cards seem to have jumped the gun by quoting "VK" calls prior to January 1929. 8/12/1928 PMG New Regulations effective from 31/12/1928 with bands available being 60,000Kc(5M)-56,000(5.35M), 30,000(10M)-28,000Kc(10.7M), 14,400Kc(20.8M)-14,000(21.4M), 7,300Kc(41M)-7,000Kc(42.8M), 1,990Kc(150.8M)-1,715Kc(175M), 1,715Kc(175M)-1,200Kc(250M). There does not seem to be any official declaration of the call sign format so many experimenters used their own interpretation by adding a hyphen or a full stop to their call signs as printed on QSL cards, such as XA-4CD, OA2-BH, VK.2AK and VK-4SU. There was even VK3D.L. and VK3--H--W. Some, perhaps speculating on further changes, abbreviated their QSL cards to show just the number and letters, such as 4WK and 5BJ. Magazines of the era often left the prefix off the calls when reporting experimenters' activities anyway. Amateur Licences in Australia were withdrawn on 31 August 1939. 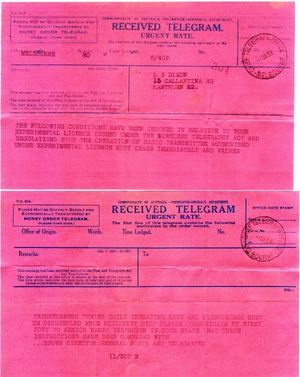 Refer to the Telegram advice photo. - Christmas Island – ZC3 (pre-1940), Japan (1940 to 1944), 9V (1945 to 1958), VK9X from 1958. - Cocos Keeling island – ZC2 (pre-1940), VK9Y (1955 to 1992), VK9C from 1992. - Papua New Guinea – VK4 / VK9, now P29 from 1972. - Nauru – VK9 now known as C2 (since 31 January 1968). - Macquarie Island - VK1 to 1955, VK0M since 1955. Finally, the PMG recognised a changing understanding of the terminology and "Experimental Station Licensees" officially became "Amateur Station Licensees" from 19 September 1947. Callsigns subsequently were issued as a 2 by 2 callsign, ie VKnXX and VKnAXX formats. Licensees also were able to obtain a callsign for “Mobile” station operation. The Limited Amateur Operators Certificate was introduced in 1954 and issued to applicants who were restricted to using the VHF bands and above and without morse code privileges (CW). The limited licence callsigns were issued using the Z suffix, eg VKnZXX. The 3nd LAOCP licence in Australia was issued to Mr Frank (Mick) Pettiford in Queensland, VK4ZAA. VK0 callsigns only came about (around 1955 ??) , keyed around the Antarctic treaties at the time. Until that time, Macquarie Island and Antarctic area ? callsigns were known as VK1. In 1975, a Novice licence was introduced using the callsign format VKnNXX. From 1980 those with both restricted and limited accreditations, the callsign format of VKnJXX and VKnKXX was used, and was later called the Intermediate licence. The Novice Limited callsign was introduced later and used the VKnHXX format for novice stations without any CW privileges. The Papua New Guinea callsign prefix was known as VK9 (and VK4 for a period) until 1972 when it became a United Nations Trust Territory and was assigned the P29 callsign prefix. The Australian callsign prefixes AX, VL, VM, VN and VZ were added around 1973, but only the VI and AX prefixes are ever issued (with usage restrictions) to amateur operators in Australia since 1979 . The AX prefix is permitted to be used to substitute for the VK prefix during commemorative events, such as the 1988 Bicentennial, 2000 Sydney Olympics and Australia Day (January 26 each year). The AX prefix is generally assigned in a more permanent fashion to military and experimental licence holders. The Australian Government (SMA, DoC) up until 2001 had retained the callsign sequence VKnAA for use as their 'official callsign'. These were released over a 8 month period from mid 2001 to early 2002. The first releases of these "AA" suffixes had no publicity, but once word got around, the bar was raised for the allocation of the last couple of callsigns, eg, VK8AA and VK7AA required applicants to provide a full written justification along with the usual licence application forms. When the Australian Communications and Media Authority (ACMA) dropped morse code from Amateur licensing exams on 1 Jan 2004, only the VKnXX series callsigns were being re-issued to previous holders of 10wpm morse accreditation, and were not available to new applicants. From 19 October 2005 licences were consolidated into 2 classes, Advanced and Standard, and VKnXX series were being quarantined pending new equitable issuing rules until 2008. On 1 Jan 2006, the ACMA introduced a 3rd class foundation license using the general callsign format VKnFXXX , and in the external territories eg VK9FXXX for Christmas Island, VK9FNXX for Norfolk Island etc. • Cocos Keeling Island VK9Yx changing to VK9Cx, VK9Cxx in 1992 and then adding VK9FCxx in 2006. • Lord Howe Island VK9H changed to VK9L in 1992 and adding VK9FHxx in 2006. • Norfolk Island VK9N and adding VK9FNxx in 2006. • Willis Island VK9W and adding VK9FWxx in 2006. • Mellish Reef – VK9M and adding VK9FMxx in 2006. • Macquarie Island – VK0M changed from VK1 circa 1955. A new ACMA policy, effective February 15, 2008, allows amateurs who hold a non-Australian Amateur Radio license to operate up to 90 days under a Class Licence; licensees who will be in Australia for more than 90 days will need to apply for an Australian Amateur Radio license. From 16 May 2008 holders of Australian Advanced licences are now able to operate in the participating CEPT countries while visiting those countries on the basis of their Australia licence. In mid 2008, the ACMA and WIA introduce a ballot bidding scheme for the issue of 2x2 VK callsigns eg VKnXX. There is anticipated to be 2 callsign ballots per year. This came in response to an unfounded perception that 2x2 VK callsigns (eg VK2CZ) have some type of exclusivity or advantage. Oddly, around mid 2009, the ACMA then restricts the issue of VKnZxx callsigns only to those who have previously held them(?? not 100% what the conditions are, but they are quite restrictive - happy to receive accurate advice). As a result some operators are now returning to their old "Zed" callsigns, as these are now deemed "exclusive". On 2 Jan 2012, the ACMA permitted applications for a 1KW PEP RF power permit to Advanced licensees operating on restricted parts of the HF allocations. The 160m and 30m bands; and the 40m allocation from 7.1MHz to 7.3MHz are presently excluded, and no portable / mobile operation at this power level is permitted. The permit cost $41, and was initially valid for up to 5 years, dependant on your base license expiry date. The ACMA and WIA have not publically released their logic behind the 1KW permit band restrictions, with opinion that the 160m was never requested or is classed as being outside the HF bands, and the remaining bands are not primary allocations. Traditionally and historically Australia and New Zealand have each boilerplated and reciprocally cross adopted most new licensing legislation and regulation rulings effecting telecommunications, however with New Zealand leading the 1KW permit change, the ACMA and WIA had to do something in response. While the ACMA conditions requires an EMR Safety Compliance submission, the WIA do not. With many 1KW permits now being issued without any EMR safety assessments, clearly shows it is about the money or popularity of the permit only. The ACMA suspended the 1kW licenve permit after 8 months, citing that approx 150 licensees actually applied for the permit, but only 25 or so actually submitted EMR Safety compliance documentation. While the ACMA was open to supporting the high power concept, the poor response with EMR safety assessments was interpreted as a uncaring attitude to safety. Following a 2018 open tender, AusTender reference 18ACMA148, the ACMA selected the University of Tasmania - Australian Maritime College (AMC), deliver amateur radio examinations, issue amateur certificates of proficiency and for related callsign management. The Wireless Institute of Australia (WIA) Deed of provision of services came to an end on 1 February 2019. The ACMA is finalizing a Deed with the AMC for the delivery of services and will make enabling instruments available to support the AMC’s engagement. Once executed, the ACMA expects AMC to progressively commence delivery of services from 25 February 2019. During the transition, ACMA will consider any applications for certificates of proficiency directly. A certificate may be issued if the applicant has successfully sat an approved examination under the previous WIA arrangements. - Richard Rogers, VK7RO and reference to the Tasmanian Archives for Trevor Watkins 7AA. This page was last edited on 2 February 2019, at 00:35.